There are some things in life you truly have to see to believe, and this car spinning out of control on a major highway, somehow ending up in reverse (while facing oncoming traffic), and then righting itself — without hurting a single person — is one of those things. Seriously guys, our adrenaline is pumping after this. 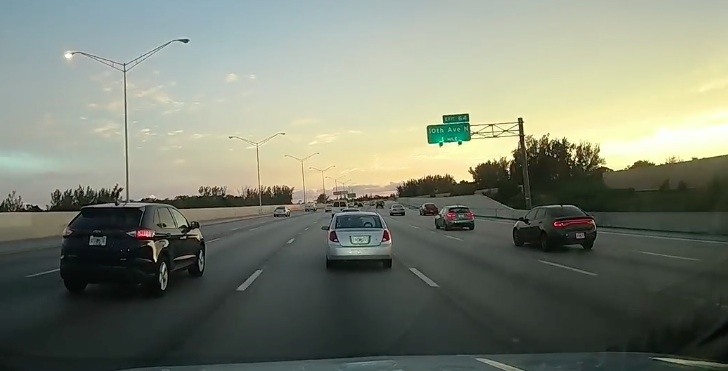 The incident occurred in Southern Florida on I-95 and was captured via dashcam by a driver who happened to be on the highway that day. The car, a Saturn, attempts to merge into its right lane without signaling, but then must quickly return to its original lane to avoid another car. The last-minute move caused the Saturn to spin out in what appears to be every driver’s worst nightmare. But, miraculously, disaster was avoided. We’re honestly not sure if everything turned out okay because of the driver’s incredible Jason Bourne-like skills or because of good old-fashioned luck, but we are sure this is likely a story the driver and all witnesses will never, ever forget. Let this be a lesson. ALWAYS USE YOUR SIGNAL. And stay alert while on the road, people.